You may or may not have noticed, but there are have been some gradual changes to the product listings on this webstore. You will find tabulated sections to the description of each product along with links to where else you can buy it (you don’t have to buy it on this webstore). One of the links being added is to the Open Gaming Store. Slowly but surely, all products are being added to the Open Gaming Store in PDF form. I’ll update in a Throne Report when that’s completed. The next big projects on the development list are the previously announced d100 RPGs, Antiquity and Terrestrial, and a game that hasn’t been announced yet. Along with Cryptozoology #02 as well… After that, a couple Dark Ages Ultimate Guides that will lead to the 2nd edition of Faith & Demons: The Rising. Ultimate Characters Guide: Psionics for the Entropic Gaming System is now available. 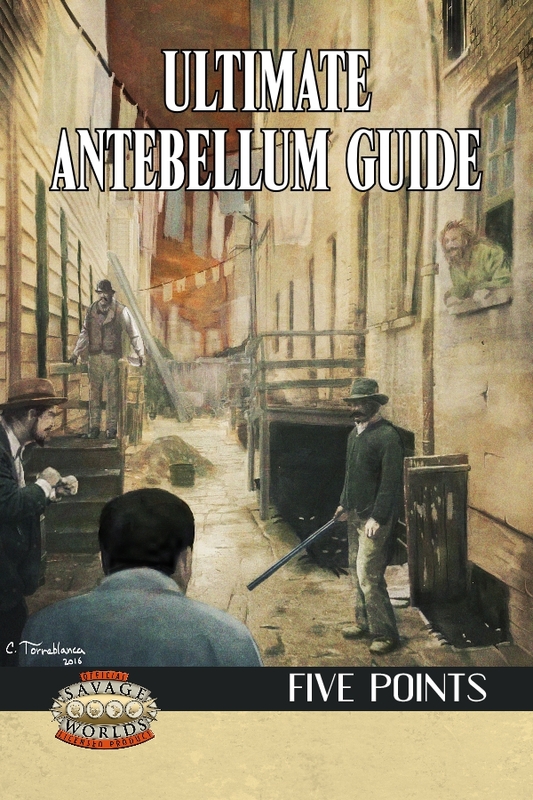 Ultimate Antebellum Guide: Five Points for Savage Worlds is now available as well. The EGS version will be uploaded in July and the Savage Worlds POD version is already available. We have lots of Ultimate Guides planned for the next year (and many more beyond that). Ultimate Medieval Guide: Feudal Japan is in layout right now. Ultimate Dark Ages Guide: Vikings is still in development, Ultimate Game Mechanics Guide: Ground Warfare is in development (this replaces Ultimate Mass Battle Guide with revised content and the addition of siege warfare), Ultimate Iron Age Guide: Celts was sent off for revisions (it will start as an EGS version and later become the 5th anniversary SW version), and finally, Ultimate Iron Age Guide: Roman Legions is in planning (the 5th anniversary revision of Ultimate Roman Legions Guide). The Little Heroes core rulebook is now available in PDF and POD. This contains additional artwork which will be incorporated into the coloring book mentioned last month. A free Scenario is pending layout and a Quick Scenario (the same length as The Lost Faery) is pending editing. Savage Insider Issue #5: CONventional Gaming is ready and will be made available on July 1.